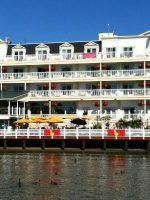 The Grand Hotel on Mackinac is often called America’s Summer Place and has been a vacation destination for families since the 1870s. Located just off the northern tip of Michigan’s Lower Peninsula (the part shaped like a mitten), Mackinac Island is renowned because of the decision by its residents in 1901 to permanently ban motorized vehicles. Instead, more than 500 horses and hundreds of bicycles take people where they want to go. That in itself creates an intriguing vacation setting for families hoping to slow down and decompress from modern society. The Grand Hotel continues that immersion into a slower, more relaxed time and place by its iconic 660-foot-long porch outlined by American flags and red geraniums. 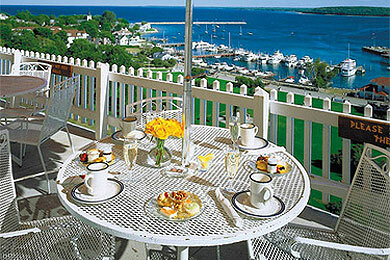 Dozens of wicker rocking chairs line that porch offering a spectacular view across the Straits of Mackinac. The elegance of the Grand Hotel speaks to an era of refinement and good taste, when families dressed for dinner, practiced the art of conversation and celebrated the events of the day over a leisurely evening meal. While The Grand Hotel is indeed very family friendly, it is certainly a place where parents may implement those lessons in good manners, particularly at the evening dinner. Young men must wear a coat and tie and young ladies should wear a dress. While the kids may gripe and complain in your rooms, once everyone appears in the Main Dining Room, they become entranced by the setting and usually enjoy themselves, even if they won’t admit it. The grounds of the Grand Hotel are equally well-groomed and include tennis, swimming, golf, croquet, Bocce ball and an oversized chess set. Families may explore these together or kids 5 and older may enjoy it all in the company of others their age via the Children’s Program while adults enjoy the day or evening together. However, the most celebrated member of the Musser family is Sadie, the Scottish terrier who won Best in Show at the 2010 Westchester Kennel Club Show. A room devoted to Sadie’s accomplishments is furnished with board games and quiet activities for families. As a family-owned resort, the Grand Hotel is particularly attentive to the needs and interests of families while providing optimal service for adults celebrating special occasions without their children. Older children may recognize the names or images of Hollywood stars Jane Seymour, Christopher Reeves and Christopher Plummer. 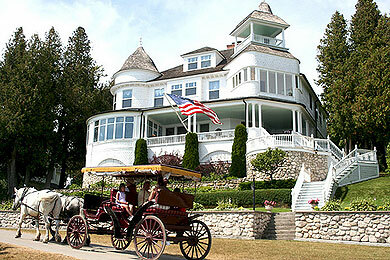 They stayed at the Grand Hotel which shot the 1980 film “Somewhere in Time” with the hotel as its back-in-time backdrop. Today, fan club followers make a pilgrimage to the hotel to pay homage to film. 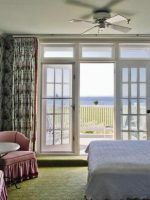 The Grand Hotel has 390 guestrooms and suites, each with a distinct floor plan and decor. 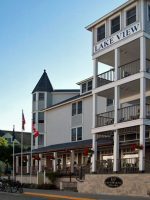 Choices include lake view or island view, balconies or bay windows, one- and two-bedroom suites, Jacuzzi tubs and more. Some of the suites are named for celebrities who have stayed in those rooms, as well as seven first ladies and numerous heads of state. All rooms have mini bars, but only the suites have full refrigerators. Children under 11 years of age stay free in their parents' room. Adjoining rooms are also available. Cribs are available at no additional charge. For larger families, the hotel's four new Cupola Suites are ideal. 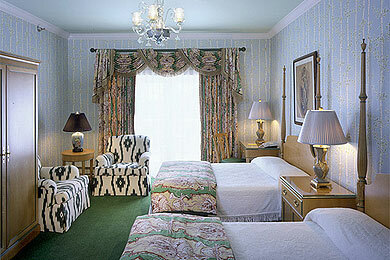 Each Cupola Suite has four bedrooms and two parlors. They are located on the fourth floor of the hotel and are reminiscent of when the hotel first opened in 1887. Much of the splendor of the Grand Hotel is its vastness and sprawling nature. 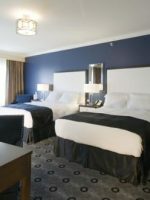 Guestrooms and amenities are located on four floors, which sometimes appear confusing in their layout and accessibility via stairways and elevators. In the first day or so of your visit, make sure children (and adults) have maps with them before exploring the property on their own. Also, each individual guest will be presented a guest card, which should be carried at all times. If teenagers explore on their own, it is important that they carry their own guest card. Not only does this facilitate dining and shopping, but also helps verify which guests are authorized to be on various floors of the hotel. The hotel is cool and very historic. Our room was just so-so. Seemed very dated, flowery (girlfriend, now wife liked it). The food - breakfast and dinner daily in package was fabulous. I liked the golf the best - the two separate 9 holes courses are wonderful - very scenic and playable. Although Mackinac Island is now a Michigan State Park, it was once a United States' national park, just behind Yellowstone's designation. It has been under French, British and U.S. rule, was the capital of the North American fur trade for many years, and was where the first shots of the War of 1812 were fired. Therefore, a day at Fort Mackinac is not only a pleasant activity for the family, but a great history lesson. Located on the highest point of the island, the fort includes numerous viewing platforms and interactive exhibits for kids. A uniformed fife and drum team performs throughout the day and cannon fire explodes several times a day. The fort is stroller-friendly for the most part but the loud cannon booms may be frightening to younger children. The Esther Williams Pool is heated and is a serpentine-shaped pool, which means that it meanders somewhat snake-like for 220-feet. Although there is not a children's pool per se, one end of the pool is designed for children with about 12 inches of water. Limited pool toys are available. Mackinac Island has more than 60 miles of trails for hiking, horseback riding and bicycling. Many families can make arrangements for a picnic lunch, ordered the night before and picked up after breakfast in the main dining room, and then simply spend the day riding and exploring. British Landing Park, on the northwest side of the island, has a lovely beach and a nearby nature trail. While the Grand Hotel does not offer horseback riding for guests, the concierge can make arrangements at any of the liveries on the island. There are two butterfly houses on Mackinac Island, in large part because of the beautiful lilac bushes that flourish on the island. The Original Butterfly House and Insect World are located two blocks from the ferry docks on McGulpin Street. The Wings of Mackinac Butterfly House near the Grand Hotel contains more than 500 butterflies and several education specialists who can talk with your children about the metamorphosis of a butterfly from larvae to caterpillar to the full-grown butterfly. Kids will also enjoy an afternoon at the children's art center in the lower level of the Manoongian Art Museum, located in Marquette Park. Each day, the art theme is of a different component of island life, from horses to leaves to water to bicycles -- all subjects that kids love and learn from. There is a small charge for admission, but parents and children are encouraged to participate together for a few minutes or a few hours. The Grand Hotel has several restaurants throughout the island, each with its individual menu and style. However, children are welcomed at each and a children's menu is available. Breakfast, lunch and dinner are served in the Main Dining Room. Breakfast and lunch are informal and include buffet or table service. Dinner is a five-course meal and appropriate dress is required. Children may dine with their parents or dine together as a part of the Children's program. Executive Chef Hans Werner Burtscher developed a children's-only evening buffet that includes hamburgers, hot dogs, PB&J and similar treats. For breakfast, a less formal option is a continental breakfast available from 9:30 to 11 a.m. at the Geranium Bar just outside the Main Dining Room. If the Grand Buffet in the Main Dining Room is a little overwhelming for lunch, the Carleton Tea Room serves light sandwiches, soups and salads from 11:30 a.m. to 3:30 p.m. The Pool Grill also offers snacks during pool hours. Picnic lunches are also available. Order forms are available at the Concierge desk or simply ask your server at dinner. Picnic orders must be placed by 9 p.m. the prior evening for next day pick-up. A part of the Grand Hotel complex, yet accessible without entering the hotel, the Gate House is part sports bar, part family entertainment venue, but with high-quality food. The white fish sandwich, something you must get your kids to try while on the island, is really good here. The children's menu includes peanut butter & jelly, mac & cheese, and chicken noodle soup, as well as a draft root beer to drink. There's a game room adjacent to the patio dining that includes shuffleboard, air hockey, and other such goodies. For your older children, there's live music in the evening and several big screen TVs to watch their favorite sports events. The bright red and white umbrellas of the Jockey Club create a fun and sporting atmosphere for lunch or dinner with a view overlooking The Grand Nine golf course. Building on the horse theme that is prevalent throughout Mackinac Island, the Jockey Club decor is filled with horse racing memorabilia. A children's menu is available. Each evening, S'mores are available for families gathered around the fire pits at The Jockey Club. 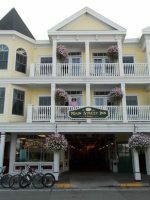 This restaurant is reached via a short walk or buggy ride along the back trails of Mackinac Island and appears as an Old World hunting lodge with oversized fireplace and heavy furnishings. (Think Gaston's home in "Beauty and the Beast.") The building that houses this restaurant was originally designed as an amusement/entertainment facility for the young people of nearby Stonecliffe Mansion. A duck pin bowling alley remains, along with a small stage where children once performed skits. Tables are covered with white paper and children are supplied with a cup filled with crayons. The menu includes wild game, such as rabbit and venison, but a children's menu of mac & cheese, burgers and hot dogs is also available. On a beautiful summer day, there's no more lovely spot on the island than the veranda at Fort Mackinac to have lunch. Located at the highest elevation on the island at 150 feet, the view across Marquette Park to the Straits of Mackinac is spectacular. There's always a special of the day, but the pizza, sandwiches and salads are always fresh made. And of course, there's the Grand Hotel Pecan ball in Fudge Sauce. Tipping is not allowed or expected at the Grand Hotel. Children's bicycles are available at no charge each day from the Pool House. The Fitness center is located adjacent to the pool and includes all amenities, but a unique feature is the Vita Course, an outdoor jogging trail that includes stops for additional exercise and stretching. The Astor Spa includes children's manicure and pedicure option along with hair cuts for children. The Grand Hotel is only open from early May until late October. 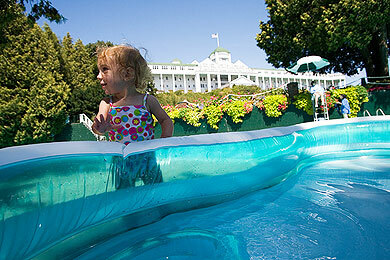 As "America's Summer Place," the months of July and August are the busiest at the Grand Hotel. 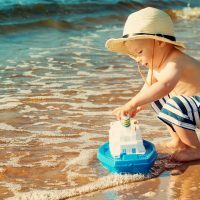 If you can book your travel at other times, you'll enjoy better rates and fewer crowds, however, the Children's program operates only from Memorial Day to Labor Day. One week in late July and another in August is dedicated as "Family Added Value Days," which means special movie nights, ice cream socials and other events at no extra charge to families. Three ferry lines provide service from Mackinaw City and St. Ignace and prices are just about the same with each. They are Shepler's Ferry, Arnold Transit and the Star Line. 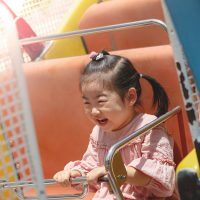 Definitely consider ordering those tickets online in advance because you can save a couple of dollars per person, receive a free pass for kids with adult purchase or receive coupons for other savings while on the island. If you bring your own bicycles, it will cost additional, per bike, on the ferry. Mackinac Island has one small airport available for private aviation and serviced by Great Lakes Air. Otherwise, the closest airport is about 20 miles away in Pellston, MI. Wolverine Stages (231-539-8331) is a shuttle that provides services from the airport to the ferry stations to Mackinac Island. In 1901, island residents permanently banned motorized vehicles on the island. Instead, more than 500 horses and hundreds of bicycles take people where they want to go. During your stay, make time for one evening at The Cupola Bar where live piano music and dancing accompany one of the best sunsets you'll ever experience. Dancing to big band music is also available each evening at the Terrace Room. The Audubon Wine Bar is a quiet library-type setting where adults may enjoy a glass of wine as early as 4 p.m. each day. The Grand Hotel hosts numerous special weekends, particularly in the shoulder season, such as the Ballroom Dancing Weekend in October or the Somewhere in Time Weekend, both in October.